When my son was in the NICU the hospital offered infant massage. I was very interested in any type of alternative therapy to help with the pokes and prods my sons endured daily. So, I did some reading and found that there were many benefits to infant massage so, I took advantage of the service. Massage has been practiced for centuries in many cultures around the world, such as India, China and South America. All babies need touch to thrive emotionally and physically. Our babies don't get much touch. Massage has some special benefits for premature babies. A gentle massage gives your your preemie a soothing touch. With a series of gentle strokes and gentle leg and arm movements,your baby can experience many benefits . Creates sounder and longer sleep patterns. The baby can become more alert and active. A general increase in health. More and more hospital are offering massage within the hospital along with other types of alternative treatment. Get trained by a certified massage therapist because preemies (most of the time) don't like to be touched. In my experience when we first started my son could experience anything from drops oxygen saturation's to increase heart rate. So as with anything check with your NICU team before trying any type of alternative treatment. Make sure you check out this article on how infant massage therapy reduces stress in preemies. Here is a great book on infant massage called Developmental Baby Massage. to ride on his back." 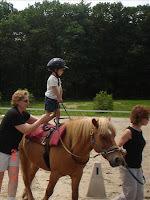 When my son was 3 we were fortunate enough to be introduced to Hippotherapy by his early intervention team. Hippotherapy is a form of physical, occupational and speech therapy in which a therapist uses the characteristic movements of a horse to provide carefully graded motor and sensory input. (Wikipedia). I can't explain to you in just a few words how much he loved it. Due to his physical limitations he had always had a difficult time running and playing as most children do, but on the horse the biggest smile would overcome him. He continued Hippotherapy until the age of five. We then decided to try other activities, adapted sports such as baseball (the most he would participate in this sport was sitting on the field and playing with the sand, waiting around just made him more anxious) then it was soccer (he chased the butterflies more than the ball). Nothing seemed light up his face like the horse. Since my son is already getting OT, PT and Speech in school as well as private OT. I began researching Therapeutic Riding vs Hippotherapy . Therapeutic Riding (also known as equine-assisted activity or adaptive riding) is used to teach riding skills to people with disabilities. Therapeutic riding is beneficial for children and adults who present with any of a wide range of cognitive, physical, and emotional conditions (wikipedia). been 5 years since we had back) I was amazed at how quickly it all came back to him. His first response? "Lets trot and go fast"
Horseback riding is recognized as one of the more progressive forms of therapy for special needs. Being able to control a horse as well as one's own body inspires self-confidence. What I find most important is that its overall an enjoyable experience for our kids and they get to create a special relationship with the horse they ride. social: friendship, friendship with the animal, overall enjoyment, taking part in care of animal, team work. After all, I am your horse.